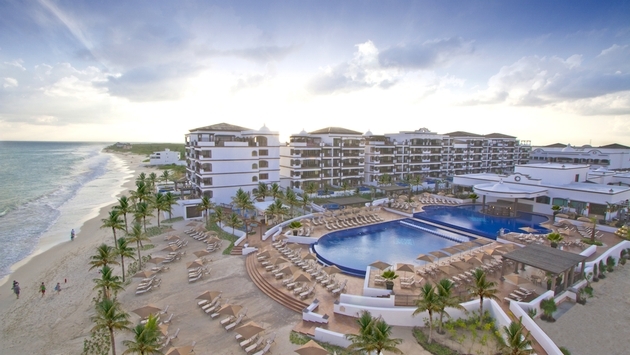 Grand Residences Riviera Cancun, which opened just nine months ago, has climbed to the No. 1 spot among Riviera Maya’s 350 hotels listed on TripAdvisor. “The resort’s success on TripAdvisor has been fundamental to the success of the property,” said the property’s general manager, Carlo Bicaci, adding that the hotel quickly rose through the rankings to become No. 1 in Puerto Morelos and then in Riviera Maya. He said the TripAdvisor rankings have broadened the resort’s reach through word of mouth and guest testimonials. “At this time, the resort holds the No. 3 spot in the Yucatan also, which includes more than 850 hotels in Cancun, Playa Del Carmen, Cozumel, Tulum and Isla Mujeres,” Bicaci said. One of the selling points of the resort, notes Bicaci, is its true all-inclusive nature. Value-added experiences run the gamut, from complimentary bike tours around Puerto Morelos to daily European high tea service to luxury turndown gifts offered each night. “We have found that these touches go a long way with guests,” Bicaci said. To round out its first year in operation, this fall Grand Residences is introducing smart bracelets to replace traditional room keys. “These waterproof bracelets provide elevator and room access and also function as a method of payment throughout the resort, eliminating the need for guests to carry around cash or credit cards,” Bicaci said. So far, the mainstay of the property’s business comes from the U.S. followed by Mexico, Europe and Latin America, he said. The beachfront property is located between Cancun and Playa del Carmen in Puerto Morelos. It features 103 suites ranging in size from 646 square feet for a junior suite to nearly 9,000 square feet for a presidential suite. Forty-four of the suites feature state-of-the-art kitchens with sub zero appliances, enabling guests to have chef-prepared meals. Restaurants include the Mediterranean-inspired El Faro Grill, for seafood and steaks; The Lobby Café, which serves up drinks and freshly baked pastries; and The Heaven Beach Bar, where guests can enjoy cocktails and casual meals.